By Alistair Reign, April 9, 2016. Alistair Reign News Blog. There is a new online resource that is putting the world news on the map; The World on The Map is a cartographic project aiming to put the world news on the map for a better understanding of current events, historical facts, geopolitical challenges and cultural issues in the visual realm of maps. Their resource website contains maps that are designed to be useful to students, teachers and general enthusiasts in the study of History, Geopolitics and International Relations All the maps available on edmaps.com have been created by Dr. Cristian Ionita, a Canadian historian and cartographer from Montreal. 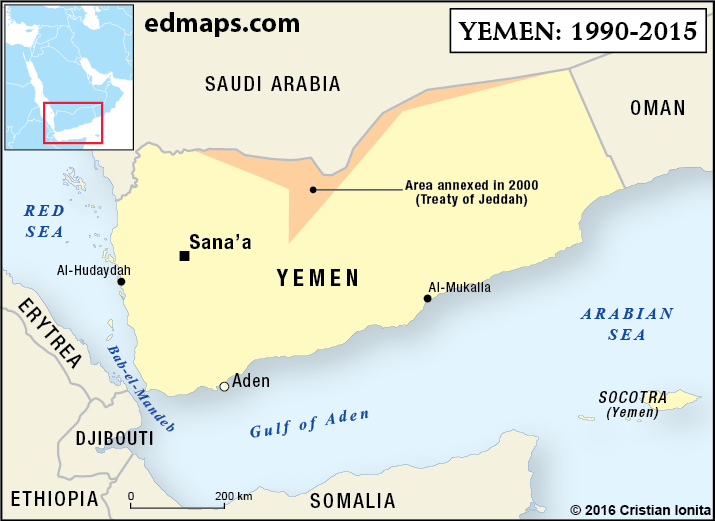 The following is a report from The World On The Map outlining the surmounting conflict in Yemen, beginning in the early 1800’s up to the current dire humanitarian crisis faced by the besieged Yemenis. By Dr. Cristian Ionita, a Canadian historian and cartographer from Montreal. Placed under the suzerainty of the Ottoman sultan since 1849, the northern region of the present-day Yemen state gained its independence on 30 October 1918, following the collapse of the Ottoman Empire. In 1926, Imam Yahya, the religious leader of the Zaydi branch of the Shia Islam, declared himself king of the Yemen and the ex-Turkish realm became the ‘Mutawakkilite Kingdom of Yemen‘. In 1925, Yemen obtained the region of Hodeida, a piece of land along the eastern shore of the Red Sea. 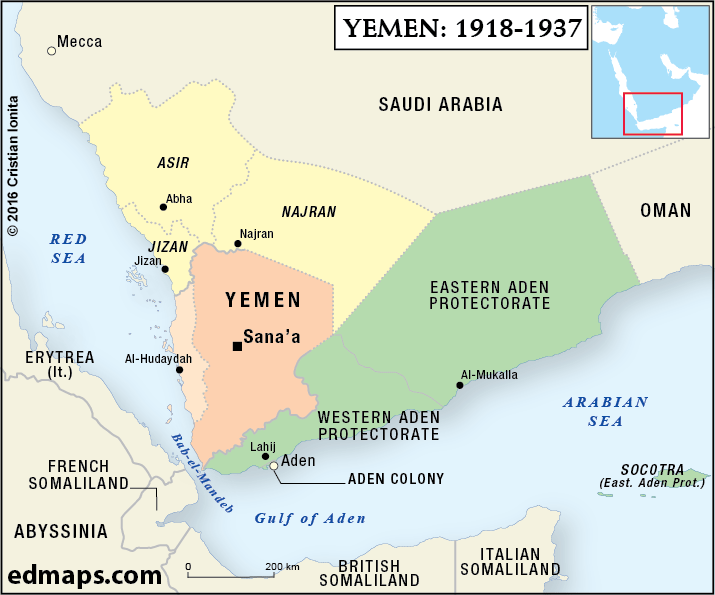 In 1934, after the signing of the ‘Treaty of Taif’, Saudi Arabia (established in 1932) incorporated some northern territories claimed by the Yemeni nationalists as a part of a Greater Yemen (Asir, Jizan et Najran). 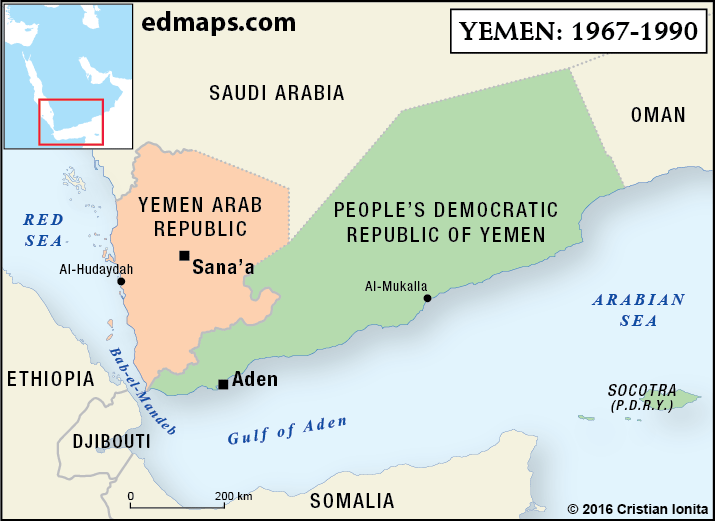 In 1969, a radical Marxist party gained the power in South Yemen and the country became in 1970 a socialist state, named ‘People’s Democratic Republic of Yemen’. 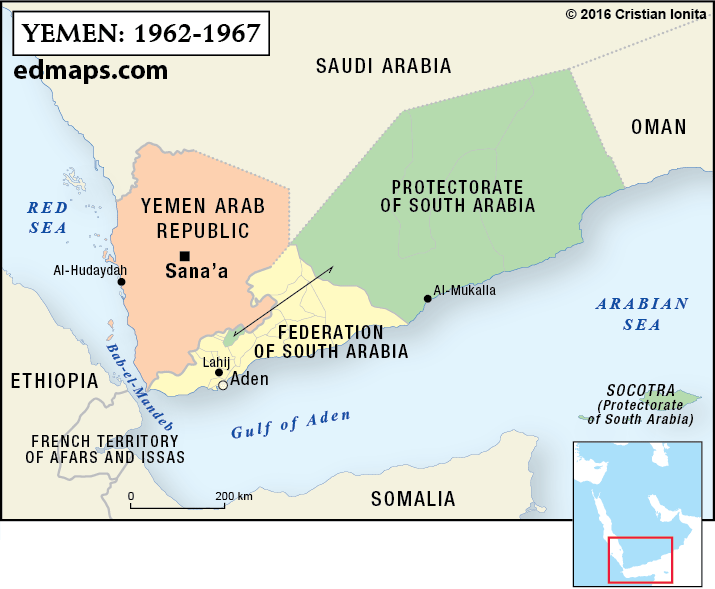 In 1972, the two Yemen’s accepted the idea of a future political unification of the Yemeni nation (the Cairo Agreement). After a period of political and ideological tensions between the two states, in 1988 YAR and PDRY renewed discussions concerning the unification. One nation, one state, but a lot of communities and a lot of divergent interests. In 2000, Yemen obtained some territories in the north (Treaty of Jeddah), but the national cohesion is only a dream. 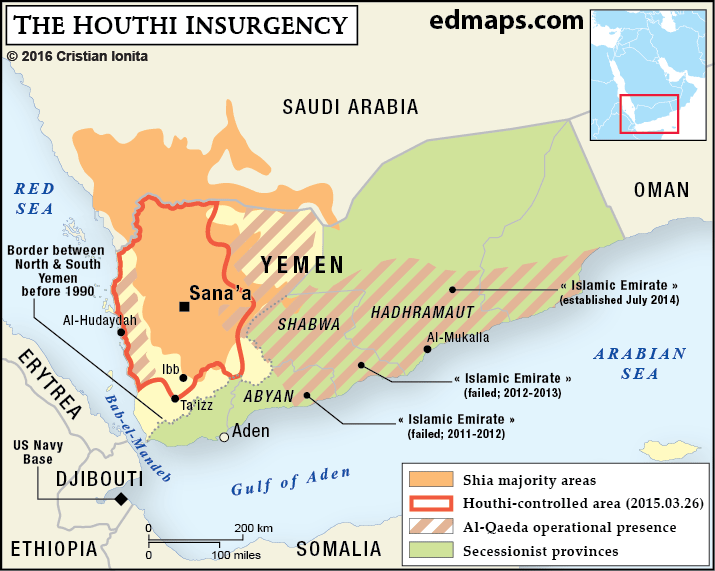 Since 2007, a southern separatist movement is very active in the former South Yemen and demands the secession from the Republic of Yemen. After the clashes between the Houthis and the government forces, and between the Houthis and Al-Qaeda, a coup d’État changed dramatically the rules of the political game on February 6, 2015: the Houthis dissolved the Parliament and created a Revolutionary Committee. That was a question for the Spring-Summer 2015. Unfortunately, the correct answer, we know it now, is a ‘civil war’ AND an ‘international conflict’, with all the negative consequences for Yemen and its people. Today’s Yemen In One Map. Be a good person on Earth . follow the Sunna th of our Nabi a Alam .may Allah bless one and all the Ummah of our Nabi.al Kareem. Ameen summa ameen. First Map I have seen of how the territories are controlled. Thank you for a wonderful wrap up.